When quality ingredients meet creativity with a contemporary twist you have the perfect combination for a unique result. Belle Donne Bistrot, located in one of the most upcoming areas of Milan, offers a Mediterranean style menu with a modern touch. I personally tried one of their specialties: “Tonno del Mediterraneo” which was really delicious. Keep in mind that many dishes are “small” as they offer a creative minimal outtake. If you want a dinner experience where you will be extra full with one dish this is not the case. If you want a dinner experience where refined flavors will surprise you then this is the perfect place. I also strongly recommend the Tartare di Scottona which is a delicious meat tartare that is actually served on a single plate with three tartare tastings. Aside from the interesting menu this bistrot offers a very charming decor and ambiance. 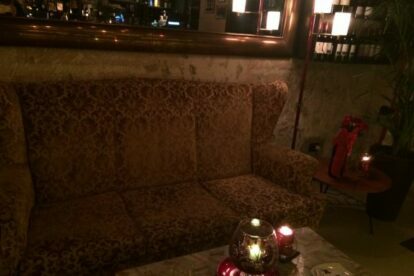 The 50s inspired restaurant has beautiful vintage tables, sofas and chairs and a great candlelight atmosphere. I also liked the fact that the space is fairly small so it never gets too crowded or loud.